As you can see above, Kyle gets worried during Easter (not for himself, he knows he's a spoiled diva) but for all his fellow bunny brothers and sisters. So yeah, Kyle says Happy Easter too. But he wants everyone to please remember and to remind people to get chocolate bunnies instead of real bunnies as pets this Easter. 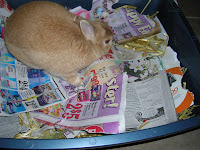 Every year, around Easter, people purchase rabbits for gifts. 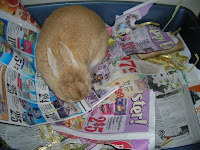 The weeks following Easter animal shelters get bombarded with bunnies, sadly unwanted and forgotten. Or even worse, people let the rabbits out in the wild. So this Easter please remember to make mine, and yours chocolate! My bunny is sadly not chocolate, but yarn instead! =D Happy Easter!